A great first round of the WSK continental series for the Engine Division of the OTK Kart Group, monopolizing the whole podium of the "Junior" category with the DJT engine. Alex Irlando returns to the Circuito Internazionale Napoli to get past the disappointment of the last Super Master Series event. WSK Euro Series will be valid as Italian OK and OKJ Championship. Drivers on track from March 28th to 31st competing for categories KZ2, OK, OK Junior and 60 Mini. On the Sarno circuit, the drivers powered by our engine are absolute protagonists. Ardigò is second in KZ2, while the first 4 places in Final for OKJ are powered by Vortex. The WSK Video Archive has been updated following the WSK Euro Series - opening event in Sarno. The complete footage of the Finals at the Circuito Internazionale Napoli have been uploaded for you to watch. The kart racer Alex Powell has just started a new challenge in the 2019 season with the WSK Euro Series. More international than ever, this competition started on March 29th to 31st at the Sarno circuit in Italy with another great performance from the young Jamaican hopeful in the 60 Mini Category. After a magnificent pole position, consistent and effective progress in the Qualifying Heats and Prefinal, Alex demonstrated all his fighting spirit and ended up mounting the second step of the podium at the foot of the famous volcano in the Naples region. The work done with the Energy Corse team has paid off again. WSK Super Master Series heading to Angerville (F) on April 28th with the new leaders: Beganovic (S – Tony Kart-Vortex OK), Bedrin (RUS – Tony Kart-Vortex OKJ) and Macintyre (GB – Parolin-TM 60mini). Puhakka (FIN - Tony Kart-Vortex) to defend the lead in KZ2 at Lonato on June 23rd. Despite all their talent and constantly competitive equipment, the Parolin Racing team drivers have not been able to achieve results that matched up to their expectations during the first event of the WSK Euro Series at Sarno. The intensity of the races that took place at the foot of Vesuvius this weekend was accompanied by various setbacks that sometimes weighed heavily in the results. However, there were good performances to the credit of the Parolin drivers. The first round of the WSK Euro Series at Sarno was marked by a reinforcement of the official Birel ART training in KZ2, rewarded by the presence of three drivers in the top 10 overall. In OK, Luigi Coluccio completed a very nice meeting by taking a 2nd position in the Final as well as the Championship. The WSK European Series starts under the best auspices for the Tony Kart Racing Team, with the victories of Puhakka (KZ2) and Bedrin (OKJ). The Tony Kart Racer 401R is also in the first position in the senior class with Beganovic of the Ward Racing team. On occasion of the first round of the WSK Euro Series, Alex Irlando makes a huge step forward with his BirelART-TM. Constantly on top from Friday, Alex Irlando couldn’t take home the big prize in Sarno because of a not perfect set-up with new tyres on Sunday afternoon. A week after Bas Lammers' crowning in the WSK Super Master Series, Sodi drivers once again shone on the Sarno circuit for the first round of the WSK Euro Series. Bas Lammers and Anthony Abbasse confirmed the performance of the French chassis by both mounting the Final podium after tough battles. With four Sodi in the top 10, the French brand achieved the best team score. The first winners in WSK Euro Series in Sarno (SA): Puhakka (FIN – Tony Kart-Vortex KZ2), Beganovic (S – Tony Kart-Vortex OK), Bedrin (RUS – Tony Kart-Vortex OKJ) and Macintyre (GB – Parolin-TM 60mini) heading to the next round of Angerville (F) as leaders on april 28th. The presence of WSK cameras will capture all the racing action on the closing day, Sunday, March 31st. The appointment with the live-streaming of Prefinals and Finals of all categories will begin at 10:00. All drivers already started to challenge each other in qualifying practice and heats to secure a place for the decisive races on Sunday. 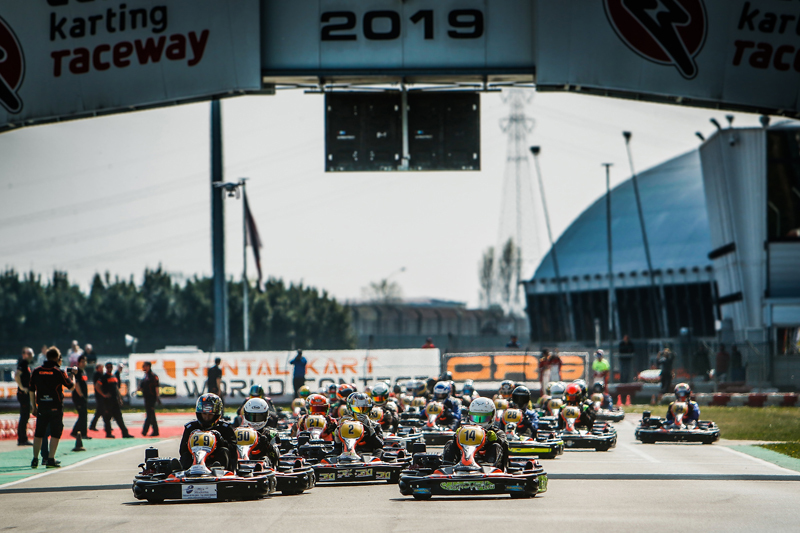 New names to the fore hunting for the win in the opener of WSK Euro Series: in Sarno (SA), Pole Positions to Camplese (I – Tony Kart-Vortex KZ2), Van T’Hoff (NL – Exprit-TM OK), Bedrin (RUS – Tony Kart-Vortex OKJ) and Al Azhari (ARE – Parolin-TM 60 Mini). WSK Euro Series kicking off from Sarno (I) with qualifying practice. on top Camplese (I – Tony Kart-Vortex KZ2), Patterson (KR-IAME OK), Bedrin (RUS – Tony Kart-Vortex OKJ) and Powell (JA – Energy-TM 60mini). The International Circuit Napoli is about to stage an important comeback: WSK Euro Series, organized by WSK Promotion, will be back in this season for four rounds. The opener will take place in Sarno this weekend, just one week after the end of WSK Super Master Series on the same track. International Karting will stay on the Circuit Napoli from Friday, March 29th to Sunday, March 31st for the first of the series four rounds that will visit Italy and France. Regarding season 2019, ACI Sport's Sporting Commission decided that the Italian Championship of the two International categories OK and OK-Junior will take place during the three Italian rounds of WSK Euro Series organized by WSK Promotion. In Sarno, the last event of the WSK Super Master Series confirmed the high level of performance of several drivers of the Birel ART Racing Team. Kremers' 4th place overall in the KZ2 series allowed him to calmly contemplate the rest of the international season, while the potential was there in OK with Coluccio and in OK-Junior with Camara. WSK Super Master Series 2019 to Lammers (NL – Sodi-TM KZ2), Patterson (GB – KR-IAME OK), Antonelli (I – KR-IAME OKJ) and Al Dhaheri (ARE – Parolin-TM 60 Mini). The closer in Sarno named the winners in an exciting finale last Sunday. The Spanish team CH-T Gold of Piñeiro, Alcaraz, Garcia and Risitano won a spectacular edition of the 24 Hours Karting of Italy with 40 teams coming from all over the world. In the Silver category, the Italian team Bolza Corse won the race. 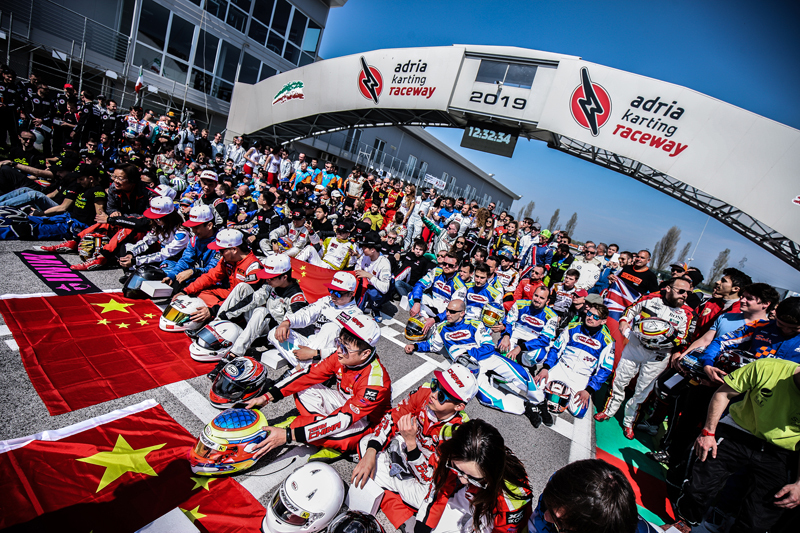 The 2nd edition of the 24 Hours Karting of Italy ended with emotions and a great show, thanks to the record number of 40 teams and over 250 drivers representing 15 different countries. The drivers parade took place on the finishing straight, after the qualifying practice, giving an incredible view and the same images were broadcasted worldwide, thanks to the live streaming, that followed the whole race until the prizegiving ceremony, on CRG’s web and social channels. Concerning the organization, the event was a great success, favoured by the location of the Adria circuit, unique in the world for its facilities, as masonry boxes, hotel rooms for the teams and several added values, as the incredible lighting system and the video control on track. From the sporting point of view, more than 10 teams were able to fight for the podium in both categories (Pro and Silver) and in the end, strategies made the difference as well as the ability in managing the kart from the technical point of view. The race was spectacular, thanks to the regulation that left the strategies free and, under the chequered flag, the gap between the winner, the Spanish team CH-T Gold of Piñeiro, Alcaraz, Garcia and Risitano, and the German team Schnitzelalm Racing of Kieslich, Schumann, Linke, Seidel, Gruebel e Moelgen, was only 8 seconds. A 24 Hours decided at foto finish also for the 3rd place, where the French team Cinecascade by Skof of Hamrouini, Bouvier, Urbani and Delien finished ahead of the Czech team Okkart Blue of Mateju, Burger, Kocka, Pytilk, Chamola and Dorcikova for 50”. Red Racing (winner of the 2018 Rental Kart World Contest) ended in 5th place, first Italian team, that lost the chance to fight for the podium only for a problem while refuelling. The top ten is completed by the Team Nutria in 6th place, PKI and PFV in 7th place, then the Pomposa Dream Team and Lamone Corse, respectively 8th and 9th. In 10th place Bolza Corse with an outstanding race, winner of the Silver Cup category, that had 5 more pit stops than the “pro” category. Then, excellent 11th place for Thunderbolt, that finished ahead of Gas RT after a nice recovery. The Spanish team CH-T Silver ended in 13th place achieving the 2nd place of the Silver Cup, ahead of DMS Motorsport, Titti’s Fuoriserie (3rd in the Silver Cup) and Lhasa-Zena Karting. To be pointed out the performance of the Team Bermuda (one of the teams coming the most far away), ended in 29th place, so as the best of the 3 Chinese teams (China GZ), ended in 31st place.